So why would the writer of inspirational romance novels choose a female outlaw as her Inkwell persona? And partly because I believe all of us, at some time or other, have been unfairly judged—surely not of something so heinous as armed robbery and the slaughter of innocent bystanders!—and can recall events from the past that help us empathize with Pearl Hart, who wasn’t all bad…. She was born in Ontario to devout Christian parents who gave their girl everything money could buy, including a fancy education at an exclusive boarding school. If only they’d known that at the tender age of sixteen, their daughter would enroll in Romance 101 as taught by Frank Hart (aka William, aka Brett, depending on whom he was trying to outrun). Sadly, Pearl also learned the meaning of ‘abuse’ under his tutelage, and was soon home again, crying on her mama’s shoulder. More’s the pity she didn’t stay put, for each reconciliation with her handsome husband resulted in another little Hart. Both children were quickly deposited at her ma’s new house in Ohio so Pearl and Frank could hunt for fortune and fame. During the World’s Fair in Chicago, Pearl worked as a barker on the midway, and one night while she slumbered in her tent, Frank disappeared. She hit the road running, working as a cook, a waitress, a singer to fund the search for her nomad spouse. She found him in Phoenix, where he promised to treat her like a queen if she’d come back to him. This time to make ends meet, Pearl took a job cooking at the Mammoth Mining camp, and when ‘all work and no play’ became too hard to bear, she hooked up with a miner by the name of Joe Boot. Happiness lasted only until Pearl got a letter from her brother, informing her that their beloved mother had fallen ill. Pearl sent home every penny she’d saved to buy Mama’s health. More letters from home told of her mother’s worsening condition. Pearl and Joe worked harder, and when their scrimping and saving still wasn’t enough, Joe suggested they rob a stagecoach. And so on May 29, 1899, the reluctant Pearl cut her hair short and donned Joe’s clothes, and tucked a .38 pistol into her belt. After the robbery, she and Joe counted nearly $500… even after handing each man on board a dollar for grub and lodging. Twenty miles and days later, Sheriff Wakefield and his posse surrounded them, and they were tossed into the Pima County jail. By October 12th, she escaped with the help of Ed Hogan, serving time in a cell near hers for a myriad of crimes. But Wakefield wasn’t about to allow a woman bandit to make a laughingstock of him and his deputies! He tracked her to New Mexico, and this time “the bandit queen” got five years… and a round-the-clock guard. 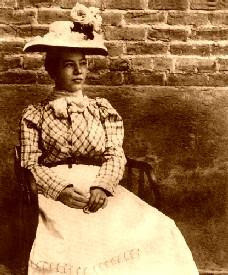 When she was released in December, 1902, Pearl wandered the country doing many odd jobs, and for a time, even worked under an alias with Buffalo Bill’s Wild West Show. Then, at the start of World War I, she met and married Calvin Bywater and, according to local lore, spent the rest of her days on his front porch, rocking and smoking cigars. And so it was that the only known female stagecoach robber and the first woman sentenced to the Yuma Territorial Prison inspired the movie Yuma, the musical Legend of Pearl Hart, and the play Lady with a Gun. Yet we’re left to wonder: What happened to Frank Hart and Joe Boot? Did Pearl return to Ohio in time to see her mother, or take responsibility for her son and daughter? Did she trade her “walk on the wild side” life for a “closer walk with the Lord” during her golden years? History provides no evidence that any of those things happened, but our imaginations can devise multiple scenarios that allow us to answer each question with a resounding “Yes… and then….” That’s precisely how the idea for Beautiful Bandit, the first novel in my “Lone Star Legends” series was born. I pray that when Pearl met her Maker at the ripe old age of 85, she did it with a contrite heart and a pure spirit, just as Dinah Theodore (my wrongly-accused heroine) will at the end of her long and happy life! 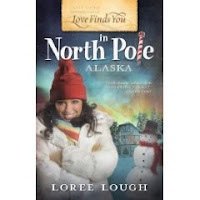 Loree is giving away a copy of her current release, Love Finds You in North Pole, Alaska as well as Love Finds you in Paradise, Pennsylvania. So please remember to add your email address to your comment if you'd like to be entered in Loree's draw. At last count, best-selling author Loree Lough had 75 books, 62 short stories, and over 2,500 articles in print. Dubbed “edgy, heart-tugging adventures” by reviewers, her stories have earned dozens of “Readers’ Choice” and industry awards. 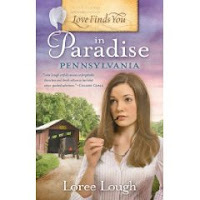 Her most recent release, Love Finds You in Paradise, Pennsylvania will be followed by two additional Love Finds You titles set in North Pole, Alaska (10/09), and Folly Beach, South Carolina (08/10). Be Still…and Let Your Nail Polish Dry! (a devotional w/Andrea Boeshaar, Sandie Bricker, and Debby Mayne) becomes available in November ‘09, and recent contracts with Whitaker House and Abingdon will add 8+ titles to the list. A frequent guest speaker for writers’ organizations, government agencies, book clubs, college and high school writing programs, and more, Loree has encouraged thousands with her comedic approach to ‘learned-the-hard-way’ lessons about the craft, and 600 (and counting!) of her former students are now published authors. Loree and her husband live near Baltimore with a formerly-abused, now-spoiled Pointer whose numerous vet visits inspired the nickname ‘Cash’. Thank you Loree for being our gracious guest today. Out there in my family room, the mantle clock is striking 6. And I'm here to say GOOD LUCK to everyone who puts their name in the hat! I have this big secret system, see, of choosing winners. Soon as I see a few comments, I'll let you in on the secret. Meanwhile, have a super day! And thanks Anita Mae for 'rounding' her up to come and guest blog. I really didn't know much about Pearl Hart, even with many trips to Tucson. I can see how her story has inspired you and these other tales. The 'what if' that we all love. Thanks for coming. I'll pop back later to see how things are going. I'm not eligible for the giveaway (hey, maybe we should work on that little rule!) but I'm intrigued by your hook. Secret system? I have never heard of Pearl Hart before. I can't believe all she did. Good post. So many stories, so little time...to write! Hi Loree!!! Thanks for sharing your guest post!! I enjoyed reading it and both of the books listed sounds FANTASTIC!!!! Please please please enter me in the giveaway.....and the suspense of THE BIG SECRET is going to kill me!! LOL not really but I am anxious to see what the BIG secret is!! Hello to you Loree! I loved this post! I wondered if I may ask you a question. I want to know if in your stories you base the characters or events on actual people or events in your life. Your writing is truly amazing!!! I love your books! Please consider this my entry in to this magnificent giveaway!!! Hi Loree! I'm so glad you joined us today. What fun to read and learn about Pearl Hart. I will look forward to reading Beautiful Bandint. And of course, the Love Finds You books. "See" you here on the 21st when I review the Be Still devo and interview you and your three co-authors. Loree, I had the great pleasure of meeting you at the ACFW conference. Thanks for joining the inkies today. I have to say that I did know a thing about Pearl Hart until I searched for pictures for your header. Good grief, but what an interesting contradictory sort of character she was. BTW my mom grew up in North Pole Alaska just down the street from Santa Claus house. In fact, she was friends with the little girl whose parents owned the store, one Mary Christmas. We still have family up there and one day I really want to visit! I can't wait to read your story. Lisa, that is too cool about your mom growing up in North Pole. It would be fun to visit. Oh, and in case we haven't thanked you enough...your headers are so gorgeous and we love you for making them for us. What a wonderful post...I so enjoy visiting Inkwell Inspirations...I would love to be entered into Loree's book drawing...the books sound fabulous...and I'm curious as to what 'the secret' is. What an interesting story about Pearl Hart. I can't wait for Beautiful Bandit now to be released. Wonderful history lesson Loree! Sounds like Pearl was pretty headstrong and definitely had bad taste in men. She needed Christ real bad in her life. Hope she found him toward the end of her life. Now there was a man worth dedicating her life to. You're so busy, how do you find time to write???? Combined with Anita's post about Annie Oakley, this has me just itching to go read a good western! Thanks for being our guest today, Loree! Connie--I don't specifically choose characters from real life for my stories, but of course I borrow (heavily! LOL) from the behavior, habits, traits, and moods of people I know! Martha--My hubby and I have a tiny cabin in the Allegheny Mts. of PA, so we get to The commonwealth fairly often. Living in the Baltimore suburbs makes trips to York, Lancaster, Paradise, etc., a quick and easy day trip. And since "my" wolves at the sanctuary (in nearby Elm) is always a good excuse to venture into Amish territory! Patti--thanks for the warm welcome. I hope to come back often! Now I have to pop out of here for a few minutes to mail some books to winners of other contests. Meanwhile, maybe you can all weigh in on when, exactly, we should close the door on this contest. 5:00 p.m. EST? Midnight? Looking forward to more comments. Goodness... While I was typing my response to your comments, several more popped in! You guys are busy bees, aren't ya! Okay...I'm off to brave the wind and rain. Back soon! Howdy Loree and everyone else. Loree, I think one of your Suddenly books was the first Love Inspired book I ever read. I now have almost every LI printed including all the LI Suspense and LI Historicals. MY shelves are full of them. Now see what you did! Deb, that's a good question. Our big contest giveaway where Inkies gave out prizes is over, so it's not like it's a conflict of interest here. Of course I can't be entered because I'm hosting Loree and it wouldn't be ethical but I've posed the question over on our yahoo group and we'll see what comes of it later. Welcome, Loree. Like so many others, I hadn't heard of Pearl. Just her name shows the pride and hope her parents had for her. Alas, not all family stories end with HEA. Thanks for stopping by. Your Cash sounds like a sweetie. I love your secret! My Riley's paws are so big, he'd be picking out two or three winners! It's so wonderful the Lord led you to him. How anyone can abuse an animal much less a human . . . Well, I'm at a loss for words. And Pearl kept running back to Frank. Aaak! I look forward to getting to know you through your past and future books. Thanks for blessing our blog. Wow, Loree! What a fascinating story! I can't wait to read how you've summed it all up. Your other books sound terrific. I can picture myself reading "Love Finds You in North Pole, Alaska" by the fire, sipping a big cup of pumpkin spice coffee! P.S. If I could, I would tie a little doggie treat to my entry -- for luck, of course! Now that was an interesting tale all by itself. Thanks, Loree! I'd love to toss my name in the hat. What a funpost, Loree! Thanks for visiting the Inkwell today. I knew nothing of Pearl Hart. What a fascinating life. Now I want to get on wikipedia or something and see what happened to her poor kids. Can't wait to read your new release! I wondered where you had gotten off to. I've missed you. This is a gorgeous and interesting site. I'd commented sooner, but had to wait for hubby to finish checking auction sites and Tennessee Vol scores. Loved hearing about Pearl Hart. One thing for sure, she had a long time to get her relationship worked out with the Lord. Let's hope she did it. This book has me all excited. Do I have to wait until June for the release? Enter me in the drawing. Hint. (I already have "Love Finds You in Paradise Pennsylvania." Come on, Cash! Slap that paw down on my paper! I love ALL your books, Loree! What a wonderful post, I love to hear where authors get their inspiration for the characters they write. What a sad story Pearl's life was. It's easy to see how you could use her life as a basis for one of your characters. I can't wait to read Beautiful Bandit and Dinah's story! I would love to be entered to win either of the LFY books by Loree, thank you! Well, here I am again, back from errand-running. And wouldn't you know I bumped in to an old friend at the post office! So we had a quickie lunch at Einstein's Bagels. So glad you've enjoyed learning about Pearl. Just between y'all and me? Pearl is my mother-in-law's name! She's going to be 89 this February and lives full time in a nursing home. Only recently has her memory started to slip. Amazing woman, for sure. And not a thing like the Pearl of Arizona history! Anita, what say you on that subject? And last but not least, a great big HELLO to long-time friend and writer pal, Donna Bolk. What a wonderful surprise seeing your name here! I'll pop back here in an hour or so to collect more names for the hat and comment on your posts. I'm one of those who'd never heard of Pearl Hart before. What a wild and interesting character she was. Thanks for sharing, Loree! this book is gonna grab me and not let me go till I have finished it. You got me girl you got me bad! I have to have this book! Great post too! WE publish our posts at 0300 EST which is midnight PST. So to be fair, when you get up tomorrow morning, use all those people who've provided email addresses until 0300 hrs. That'll give the west coast a chance to enter. Only those who've left email addresses can be entered. So Loree, if someone hasn't left an email address, don't enter them, regardless of who the are. This is actually the policy posted on the front of the blog. Hey Laurean, thank you. I haven't been chatting lately and then missed you a few times when I did. Hopefully your book sales are going good. I haven't been checking blogs since August so I'm pretty much out of the loop with what everyone's doing. where she'll be giving away the same 2 books. Except her post will be different. Thanks for the giveaway's Loree. Duly noted, Anita! I'll put Cash to work choosing the winners... who have left email addresses... first thing in the morning. And just so y'all know, we shared a dinner, a breakfast, and a ride in the van to the airport. I LOVE THIS GIRL! Great post, Loree! I enjoyed the bit of history! Can't let that much time go by again without phone calls! Which got me t'thinkin' about old Pearl, who not only left her mama, but her young son and daughter to go off traipsing the country. Made me wonder... if I felt this uneasy about lack of contact with this gal (a woman I met in an AOL writing class 15 years ago, whom I've talked with on the phone and emailed and chatted via Instant Message but never met in person) HOW MUCH MORE DIFFICULT WOULD IT BE, NOT HEARING FROM MY CHILDREN OR MY MOM! The longest I was ever away from my daughters while they were kids? One week! And though my folks live in Wisconsin and I'm in Maryland, I see them at least once a year. Do you suppose she DID see them, frequently, and the historians simply didn't bother to write those facts down? Did she send them money and warm loving letters to make up for not 'being there'? Or was she the absentee mom history makes her out to be? What are YOUR thoughts on this subject, ladies!? Y'know, I almost hate to admit this (almost LOL), but I'll bet I had way more fun reading your comments than you had reading my Pearl post! I'll check back first thing in the morning, and give it until about noon East coast time before I put Cash to work. Wishing you all a wonderful evening and a night of happy dreams! Hey, Loree! Great post! And I read in the bio about your students who are now published. Count me in that number!! I took one of Loree's classes years ago! I'm not even sure which one now. I'd have to look in my files. What a great teacher! And Loree, I'd love a copy of your timeline and notes that you offered! Should I email you directly? Loree, you are the best! I'm so glad we got to hang out at the conference. And that we're Abingdon buddies :+} Sending you HUGE hugs! 6:45 a.m. here on the east coast. At noon EST, I'll hop back over here and post the names of the winners (who get to choose whether they'd prefer a copy of LFY in Paradise or North Pole). Hope your Friday gets off to a fabulous start... and stays that way! ... and he chose Connie and Molly as the winners! I'll contact you both by email to deliver the good news and find out which title you'd prefer (and where I should send it), but I wanted to make the announcement here so I could thank you all for making this such a delightful, enjoyable event! I hope to see all of you soon... and often! Here's wishing everyone a happy and restful weekend! Better late than never. I loved reading about Pearl. I'd like to think she lived to eighty-five, so she had a chance to find God and peace in her life. Cash didn't know it when he chose the winners, but Connie and Molly are a mother-daughter reading team! He's gonna get an extra treat since I got to slide both books into one envelope! My friend and I were recently discussing about the prevalence of technology in our day to day lives. Reading this post makes me think back to that discussion we had, and just how inseparable from electronics we have all become. I don't mean this in a bad way, of course! Ethical concerns aside... I just hope that as technology further innovates, the possibility of transferring our memories onto a digital medium becomes a true reality. It's a fantasy that I daydream about every once in a while. Predilection casinos? examine this environmental [url=http://www.realcazinoz.com]casino[/url] coerce and put up online casino games like slots, blackjack, roulette, baccarat and more at www.realcazinoz.com . you can also from our untrained [url=http://freecasinogames2010.webs.com]casino[/url] pinched control at http://freecasinogames2010.webs.com and bring about genuine folding spondulix ! another unsurpassed [url=http://www.ttittancasino.com]casino spiele[/url] stance is www.ttittancasino.com , during german gamblers, assert via magnanimous online casino bonus. Validation of acquiring Our Adverse Prices at www.Pharmashack.com, The Unmixed [b][url=http://www.pharmashack.com]Online Chemist's look for [/url][/b] To [url=http://www.pharmashack.com]Buy Viagra[/url] Online ! You Can also Espy Countless Deals When You [url=http://www.pharmashack.com/en/item/cialis.html]Buy Cialis[/url] and When You You [url=http://www.pharmashack.com/en/item/levitra.html]Buy Levitra[/url] Online. We Also Be struck beside a Foremost Generic [url=http://www.pharmashack.com/en/item/phentermine.html]Phentermine[/url] In aide-de-camp of Your Sustenance ! We Hawk Trade quality [url=http://www.pharmashack.com/en/item/viagra.html]Viagra[/url] and Also [url=http://www.pharmashack.com/en/item/generic_viagra.html]Generic Viagra[/url] ! I usually don't post in blogs but your blog forced me to, amazing work.. beautiful !